In this article you can see ten amazing ideas on how you can apply matte nail polish. If you don’t want to waste too much time on your nails, you can always choose the easiest of all option – applying one base coat, but if you’re the type of person who wants them all glittery, shimmery, floral or metallic, we are sure that you are going to like what we prepared for you. All these ideas are really easy, as you don’t need any special skills to do it. However, some of them may require more than two nail polishes, but you can always do as much as your budget allows. Scroll down below and let us know which of these is your favorite! 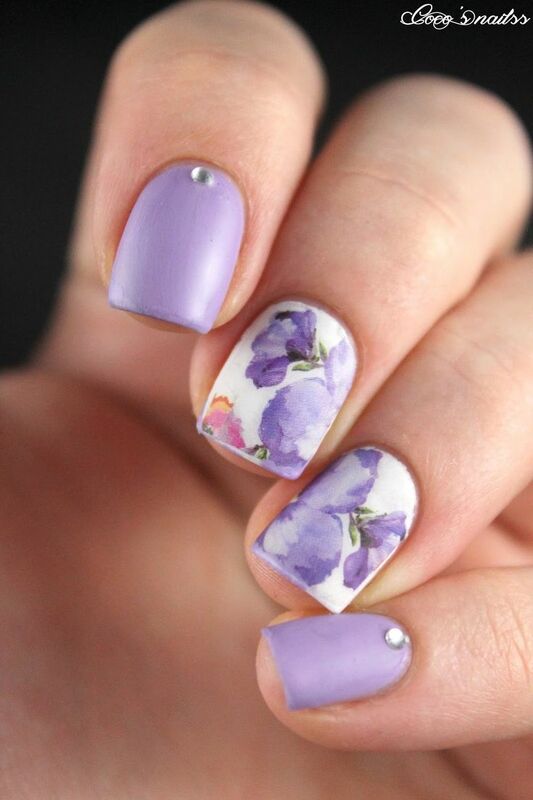 The lilac is such a gentle, calming color and in combination with flowers, it can turn out to be a really romantic nail art. To copy this idea, first make sure to have two matte nail polishes – one white and one lilac. You can also include more colors for the flowers, but that’s up to you. Creating them the same way as presented on the photo will result in a nice watercolor effect. Feeling inspired by the beauty of nature? If yes, here’s one pretty idea for you – nightfall. It might not be the easiest for you, but it is certainly a very unique nail art worth having. 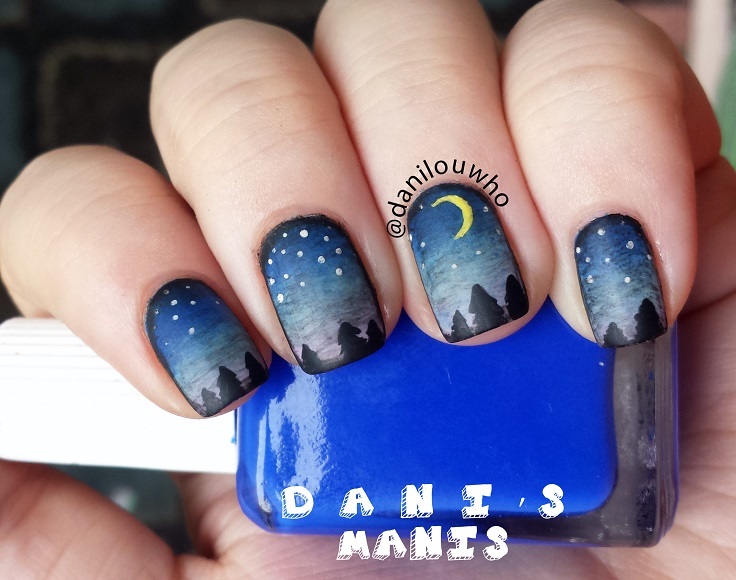 The nail polishes used for this nail art are Joe Fresh – Denim, Elevation Polish – Pic de Sotllo, American Apparel – Office, and Elevation Polish – Tavan Bogd for the gradient, use acrylic paint for the trees, the moon, the stars and the black bits. At the end it is used a layer of Seche Vite and then Butter London’s Matte Finish. If you can’t find these in your hometown, just choose similar products. We’re back to the lilac, except that this time there’s a gradient effect and a shimmer topcoat. 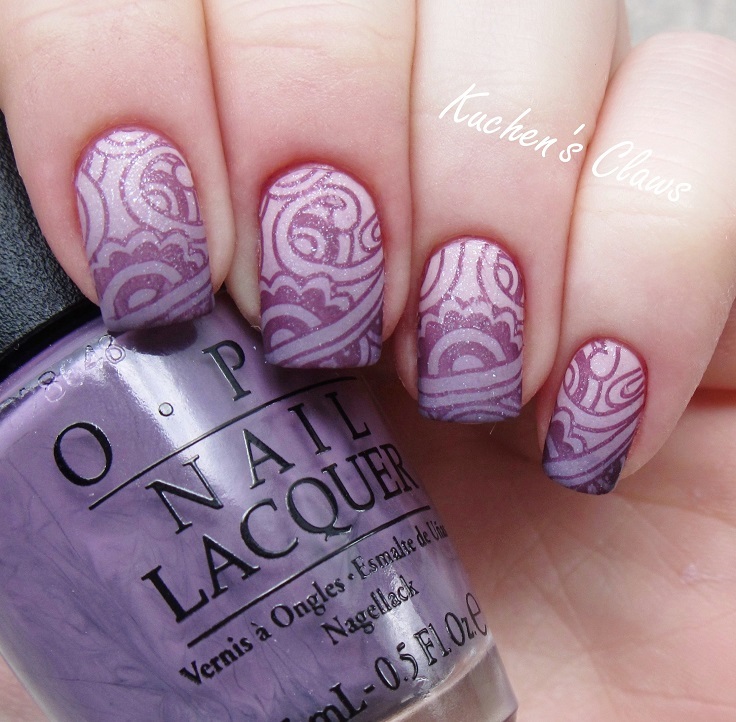 What makes this nail art so special isn’t just the color, but the stamp used as well. It creates an amazing image! The used nail polishes for this nail art are OPI “Steady as she rose”, Essie “Warm and toasty turtleneck”, and OPI “Hello Hawaii Ya” – to achieve the gradient effect. You will also need China Glaze “Charmed, I’m sure” and Essie “Pure Pearlfection” along the stamping. Here’s another beautiful example on how you can use the gradient effect on your nails. This time there’s no lilac, but black gradient with shimmery touch. It’s really elegant and still thanks to the shimmery effect, we can notice that no matter the color, the nail art is so gentle overall. Once you learn how to achieve the matte shimmery effect, you can try other colors as well. Subtle Japanese theme can be a wonderful nail art idea – especially if you’re a beginner and still don’t know advanced nail art techniques. This one is really simple, as all you need to do is just apply matte basecoat and paint few florals and the more they look like Sakura Cherry Blossom trees, the better effect yoou’ll have. The used nail polishes for this look are Seche Vite Base Coat, Green Base – 2 coats Sally Hansen Complete Salon Manicure Jaded, China Glaze Matte Magic Top Coat, for branches – Ulta Taupe On A Rope, for flowers – Essie Luscious Lips and for the flower center accents and forefinger – China Glaze Fairy Dust. 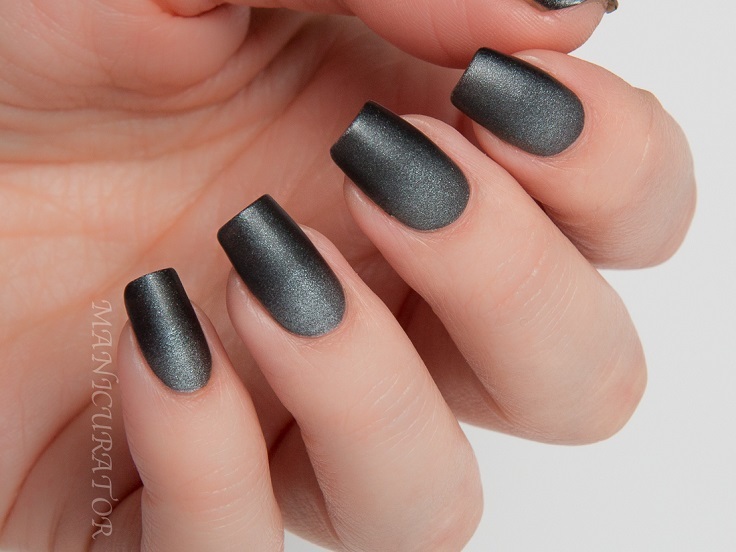 Metallic plus matte is a combination we really love – especially with a nail art like this one. The metallic silver blue polish really makes the nail art so much better, while the deep blue matte coat gives it a smooth look. For this nail art, you can use the same products – MoYou’s The Pro Stamping Plate and Revlon Nail Art Shiny Matte, or you can use similar and achieve the same effect. 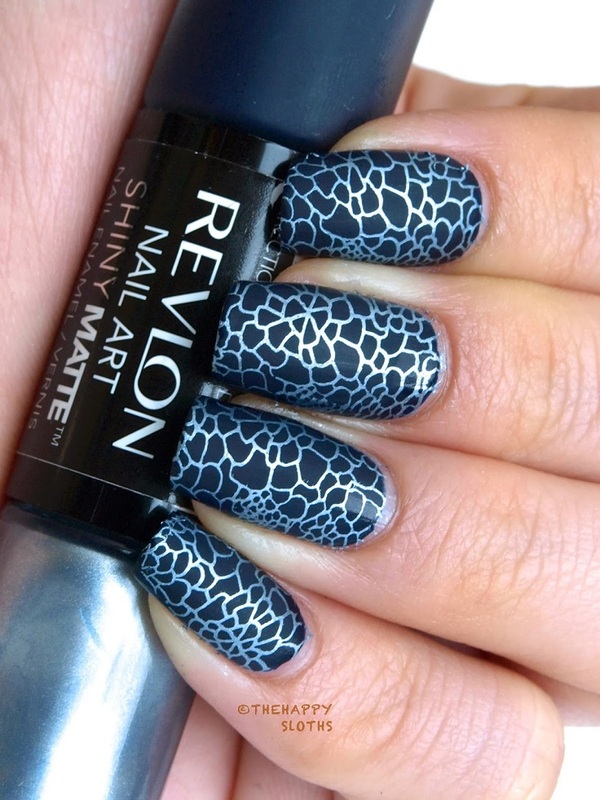 If you are a fan of animal prints, then you definitely have to give this nail art a try. It’s simple, yet really elegant! This one is really good for beginners too – you don’t need any advanced skills in nail art, as all you need to have are the two nail polishes and a little bit of creativity. The nail polishes being used here are Jesse’s Girl Black Satin (satin grey) and American Apparel Hassid (black). The galaxy surely inspire us so much when it comes to DIY projects. There are all kinds of things that you can transform into small galaxies, starting for decor to nail art. 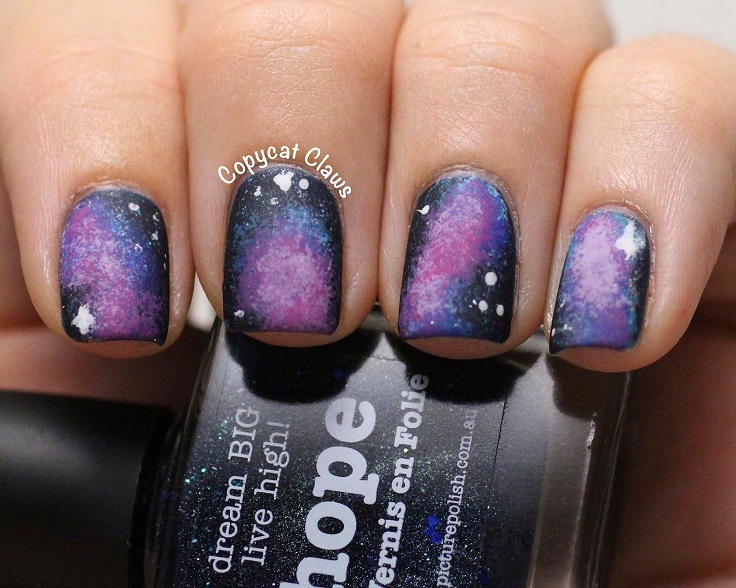 This one is a combination of few nail polishes so that you can achieve the galaxy effect. You can use these polishes – Essie Matte About You for the matte coat, China Glaze Snow for the write, Essence Let’s Get Lost and China Glaze Man Hunt for the blue, Zoya Audrina and Sally Hansen Xtreme Wear Lively Lilac for the purple. Here’s another monochrome idea that you can use for your nails. This one is all about that grey and some hearts! 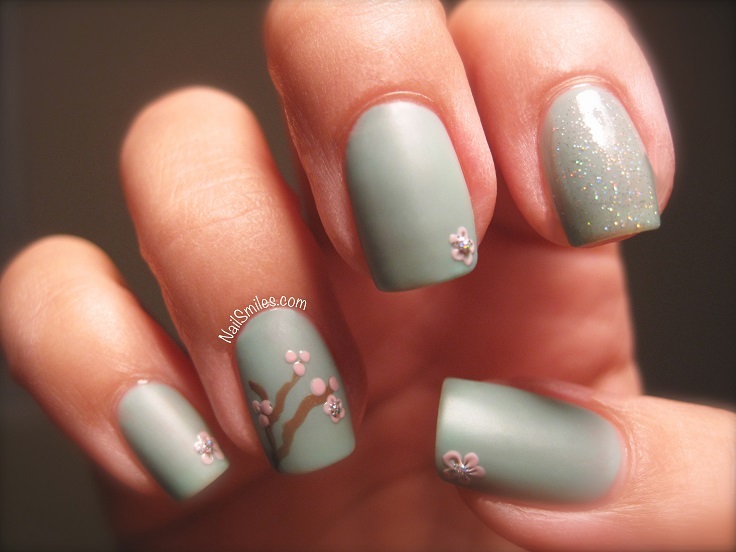 They make the nail are incredibly adorable, don’t you think? You can use the following nail polishes – OPI Alpine Snow as your first base, OPI Alpine Snow, Cement The Deal and Embrace The Gray and a top coat of KBShimmer Clearly On Top. For the hearts, you can use Whats Up Nails Hearts Nail Vinyl and diluted OPI Who Are You Calling Bossy?!? to fill in. Floral theme is always a winner combination. It’s gentle, romantic, elegant and doesn’t require any super skills. Take a look at these flowers – they are really easy to make! You can always experiment with the colors, but if you want the same ones from the photos, these are the polishes being used – Zoya Sage as a base, IsaDora City Light and Zoya Ana for the flowers and silver in the middle using A England Encore Margot and some leafs with Wet ‘n Wild – Miami Spirit.